At 850 pages, Stephen King’s 11/22/63 is a commitment. It was more than three weeks before I finished it, but once I was finished, I was glad I had invested the time. I’ll preface this review by saying, I’m not a huge Stephen King fan. Aside from this book, the only books of King’s that I’ve read are Misery and his memoir, On Writing. But the premise of traveling through time to prevent the Kennedy assassination intrigued me more than most other King story lines. 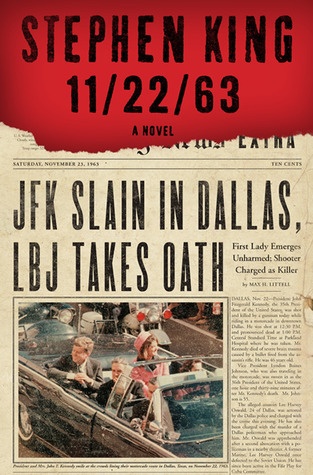 Jake Epping, an English teacher living in 2011, learns about a portal to 1958 and takes on the challenge to prevent the Kennedy assassination on November 22nd, 1963. The book takes its time getting to 1963. And though I was hooked from the beginning, there is the underlying sense throughout, that much of the book has very little to do with the actual Kennedy assassination. If you’re looking for a book to learn more about Kennedy, this isn’t it. For a while, I was okay reading along while King establishes life in 1958 and shows us the impact of Jake time traveling and changing events of the past. He spends the first section of the book laying the ground work – though it seems to me there might have been simpler ways to do this. Regardless, I was entertained and continued to read. And I continued to read as the years ticked by and Jake finds a love interest and establishes a new life in Jodie, Texas teaching and directing the high school play. Again, entire sections that have nothing to do with the main premise about the Kennedy assassination – but I didn’t mind. With Sadie as Jake’s love interest, Jake became much more human and likeable to me. What I was pleasantly surprised to discover is that underneath it all, Stephen King has really written a love story. My biggest complaint about the book was the time spent focusing on the assassin, Lee Harvey Oswald. I was patient with the many divergences from the main premise of the story, but it was Jake’s lengthy observations Oswald that I became impatient with. In the end, I can see King’s reasons for divulging into such tangents, although I felt the book most definitely could have been a tighter and, ultimately, (perhaps several hundred pages) shorter. While the novel was much longer than necessary and a bit self-indulgent on King’s part, overall I found it to be an enjoyable and interesting read. Stephen King is not a literary writer, but he is a good storyteller. This entry was tagged Books, Recommended reading, Stephen King, What I'm Reading. Bookmark the permalink. It was my first King (aside from On Writing) as well. Apparently, he and Jonathan Demme had an argument about the movie version, so that’s on hold. Interesting I can’t imagine them making a movie out of that book. They’ll have to do a lot of editing!